South Africa's Cape is simply one of the most beautiful destinations on earth. 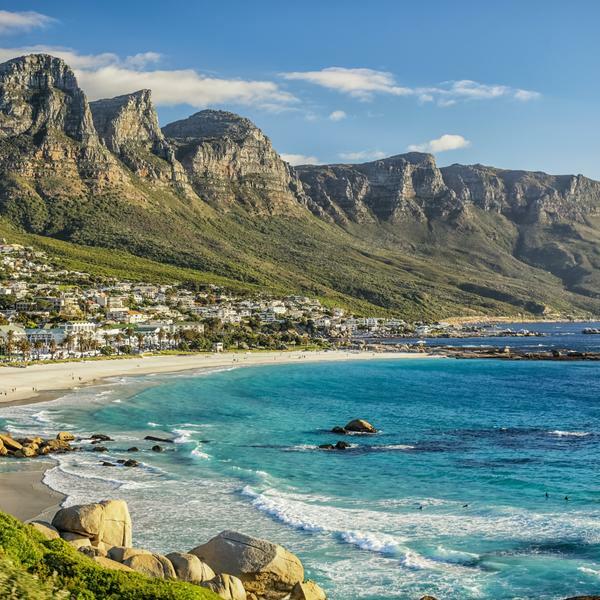 This tour will show it off in all its glory - from the rolling vineyards of Franschhoek and the rugged Table Mountain to cosmopolitan Cape Town, the coastal delights of Hermanus and Gansbaai, and the penguins of Boulders Beach. Fully escorted by an expert guide, this tour is exclusive to readers, and will see you stay in some of the finest boutique properties, as well as take in great experiences: a helicopter ride over Cape Town, wine-tasting in Stellenbosch, a boat trip to Dyer Island, admiring the golden beaches at Umhlanga in Durban, an epic drive through the Cape Peninsula, a nature walk in Fernkloof, gourmet dinners, garden visits, picnics and a city tour. Added to this is the chance to choose from three optional extensions, including a safari in Amakhala, a trip to the mighty Victoria Falls or a beach break in KwaZulu-Natal. And unlike so many long-haul destinations, there's little chance of jet lag, so you can really hit the ground running. You’ll stay in the Cape’s famed wine region, visiting Franschhoek and Stellenbosch, where you will enjoy wine tastings at leading estates. 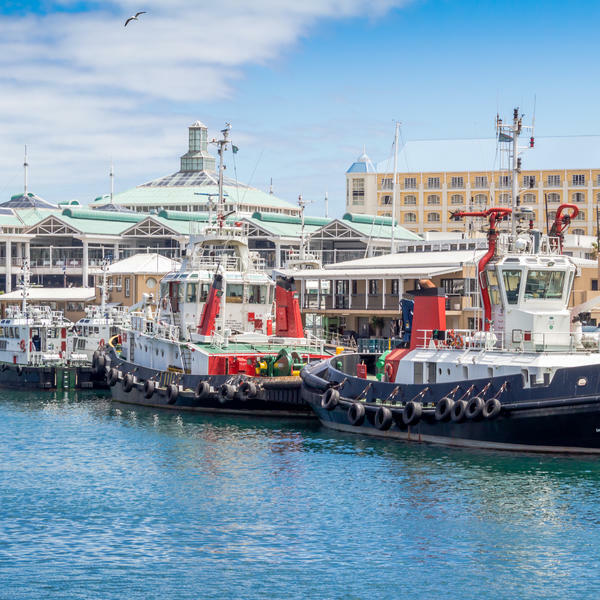 Enjoy a guided tour of the city; a boat trip to Robben Island, where Nelson Mandela was incarcerated; and a tour with a former inmate. Highlights will include a drive along Chapman’s Peak, a visit to the magnificent Kirstenbosch Botanical Gardens, and Boulders Beach. If you wish to extend your stay, we've put together three great options: a three-day trip to Victoria Falls (£1,095pp sharing), where you can take in the mighty falls, cruise the Zambezi and explore the National Park; a three-night safari, where you'll go in search of the 'big five' in Amakhala (£1,075pp sharing); or a trip to the beaches at Umhlanga Rocks in Durban (£695pp sharing), one of South Africa's premier seaside destinations. * **Prices based on two sharing. Subject to availability. Single supplement from £655. Africa Travel is ABTOT -bonded and this trip is ATOL -protected. Promotion is exclusive to Hearst. 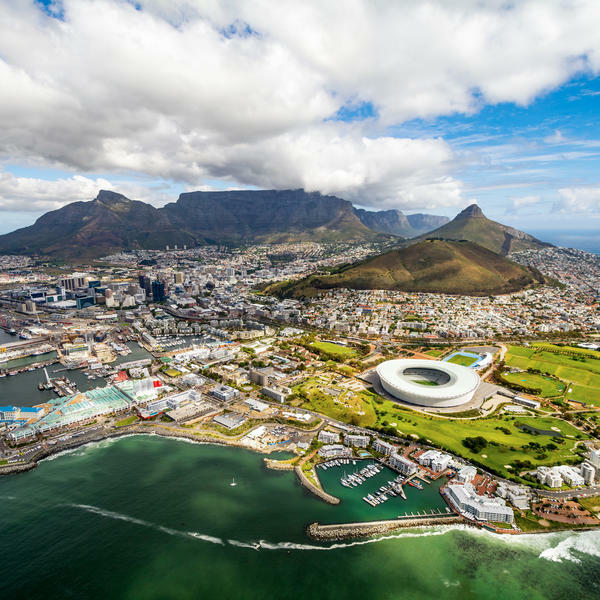 Depart London on the direct overnight British Airways flight to Cape Town. On arrival you will be met and transferred to stay for four nights on a bed and breakfast basis at the Winchester Mansions. This evening a welcome group dinner will be held in the hotel. 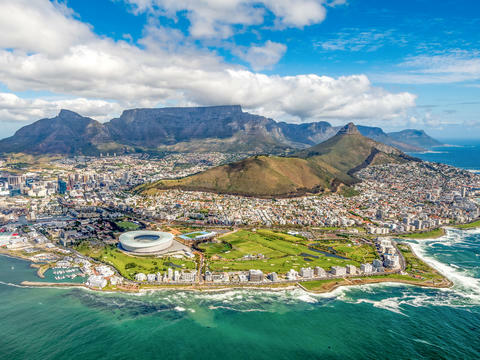 This morning you will enjoy a city tour, including highlights such as the Castle of Good Hope, Company Gardens and St George's Cathedral, before taking a trip up to the city's most iconic feature - Table Mountain. 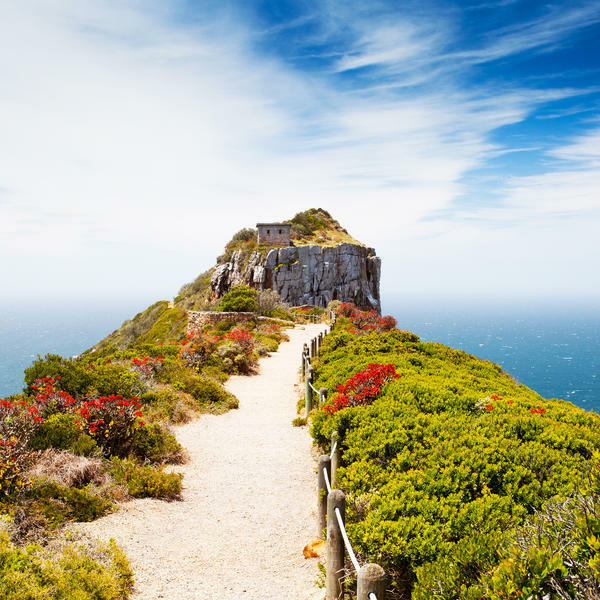 One of the New 7 Wonders of Nature, it is a mountain chain which stretches from Signal Hill in the north, to Cape Point in the south, and is the single richest floristic area in the world. It is actually home to more species of plants than the entire British Isles, despite covering an area smaller than the size of London. After taking the cable car some 1089 metres to the top, you can enjoy a short walk to explore the summit further or just soak up the commanding 360-degree views of Cape Town, Table Bay and the nearby peaks of the surrounding mountains. 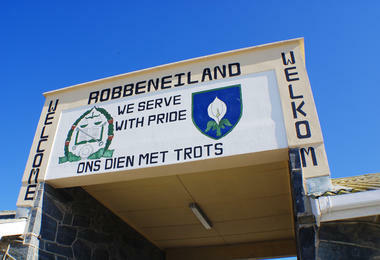 After breakfast you will take a full day trip down the Cape Peninsula. Over 30 miles in length, it juts out from the city of Cape Town and offers a beguiling mix of dramatic coastal drives, deserted beaches and quaint seaside villages, before ending at the Cape of Good Hope. The journey will include a drive along the extraordinarily photogenic Chapmans Peak Drive, a visit to the magnificent Kirstenbosch National Botanical Garden, a stop to view the unique African penguin colony at Boulders Beach, a ride on the Flying Dutchman funicular railway, and the chance to explore historic Simon's Town. The lunch stop will be on the water's edge in Simon's Town at Bertha's Restaurant. This morning the group will board the ferry for the short sea crossing to Robben Island, home to the infamous prison where Nelson Mandela spent 18 years in captivity. A guided tour will be taken in the company of one of the island's former inmates, followed by an afternoon at your leisure, perhaps spending some time exploring the renowned Victoria & Alfred Waterfront shopping complex? The journey continues as the group leaves Cape Town and travels over the dramatic Sir Lowry's Pass to the charming fishing village of Hermanus. There will be time to take lunch in one of the numerous restaurants which overlook the old harbour and sea wall, and to visit the museum, which explains Hermanus's strong relationship with the Southern Right Whale, which calls these waters home each year. After lunch enjoy a guided walk in the Fernkloof Nature Reserve. 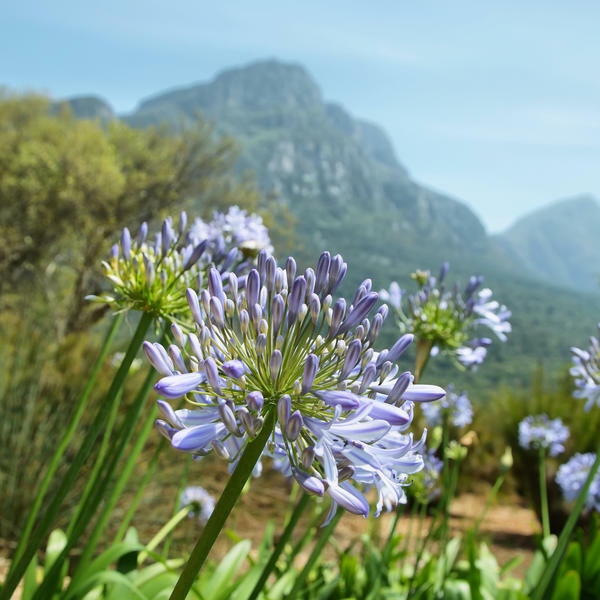 Part of the Cape Floral Kingdom, the principal vegetation type in the reserve is fynbos, and there is no other place on earth where so many different species can be seen growing in such close proximity. The reserve is also home to more than 100 bird species, and animals such as klipspringer, baboon, mongoose and dassie, with the various trails offering magnificent and unequalled views of Walker Bay, the Hemel en Aarde Valley and Maanskynbaai. The group will then travel onwards to stay for two nights on a dinner, bed & breakfast basis in the tranquil surrounds of the Blue Gum Country House. This morning the group will travel along the spectacular coastline to the small fishing village of Gaansbaai to join a boat trip to Dyer Island. 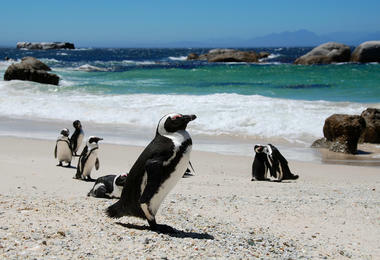 One of the richest sea bird and seal islands along the south coast of South Africa, with breeding colonies of thousands of penguins, cormorants, terns and Cape fur seals, the island is an extraordinary experience of marine wildlife. The afternoon is free to relax and enjoy the scenic surrounds and facilities of the hotel. The charming French Huguenot village of Franschhoek is the focus this morning, with the day beginning with a unique wine and chocolate tasting at the Franschhoek Cellars Wine Estate. Visits will then made to the Huguenot Memorial Museum and Huguenot Monument, before there is time to enjoy lunch in one of the village's various eateries, and to explore the many shops, galleries and boutiques of this picturesque settlement. Continue onwards to stay for two nights on a bed & breakfast basis at the NH Lord Charles Hotel. 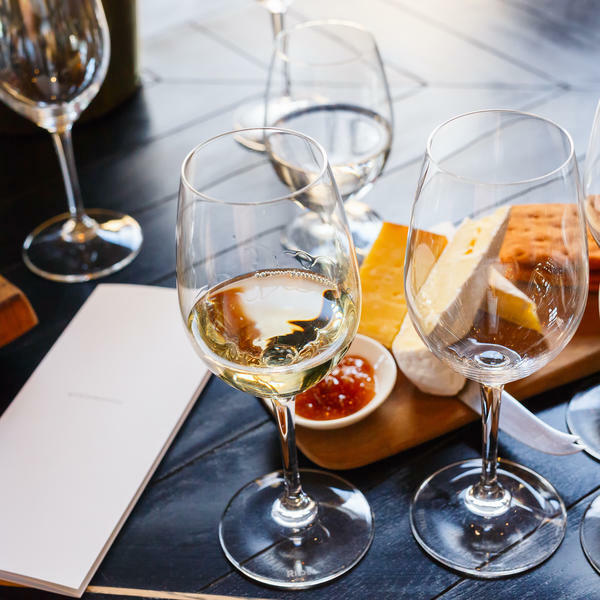 The Cape's famed wine region is again on the agenda today with the first stop being at the Fairview Wine Estate for a cheese and wine-tasting. 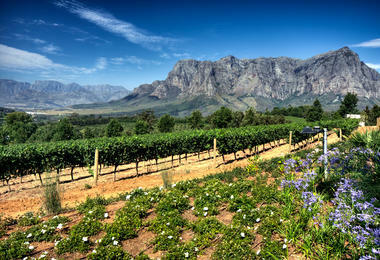 The group will then continue to another wine estate where a gourmet picnic lunch will be served. Lunch will be followed by the opportunity to explore the many delights of historic Stellenbosch, South Africa's oldest university town - amongst the highlights are the Dutch Reform Church, the town hall, museum and numerous galleries and shops, including the famous Oom Samie se Winkel general trading store. This evening, enjoy a farewell group dinner together. The morning is at leisure before the group transfers to Cape Town airport in time to depart on the direct overnight British Airways flight to London. Arrive at London Heathrow in the early morning. Winchester mansions is situated along the scenic sea point promenade with the majestic backdrop of Table Mountain. The original cape Dutch architecture, combined with personalised hospitality and professional service, inform the classic atmosphere felt throughout our hotel. An on-site restaurant, bar and spa ensure that your stay will be an opporunity to relax, recuperate and indulge yourself. Named after the 140-year old Blue Gum tree that grows on the front lawn, the estate is both a working farm dating back to 1839 and a private, family-run guest house. Owners Anton and Tarryn de Kock strive to provide you with an experience that encapsulates those things we tend to gloss over in the rush of modern life - an opportunity to relax in comfortable, tranquil surrounds with good food, superb local wines, great views and plenty of fresh air. NH The Lord Charles hotel has a spectacular setting in between the world-famous Cape Winelands, the Helderberg Mountains and the Atlantic Ocean. The scenery is out of this world, and it's perfectly placed for exploring. Located half an hour from Cape Town's centre and a stone's throw from the famed winelands, it is great for visiting the Stellenbosch, Paarl or Franschhoek wine routes. The hotel is set in nine hectares of manicured grounds, with 188 rooms and 10 suites set over two floors. Spacious and comfortable, they come with great extras like free Wi-Fi and pillow menus. Africa Travel is the UK's premier specialist offering travel to the continent. Its award-winning team has been creating exclusive and authentic itineraries for more than 30 years. To view Africa Travel’s supplier’s terms and conditions click here.